Wilmington: Is the Fighting Over? Three days ago, viewers of the Wilmington, Delaware falconcam were shocked to see two male peregrines locked in combat on the nest. The fight lasted more than an hour and in the end the vanquished left and the victor paced the gravel with a white feather and blood from the loser’s breast on his beak. An hour later the resident male peregrine visited the nest and calmly surveyed the scene. He had won the battle, but his long-time mate was dead and the new female who challenged her was claiming the nest as her own. This peregrine nest at the Brandywine Building in Wilmington, Delaware has seen more than enough trouble in the past year. Last May, two peregrine chicks were found dead and the other two leapt or were carried from the nest, though still unable to fly. One chick was rescued and placed back in the nest only to disappear a few days later. No young survived. What danger would prompt the young to leap? What would kill them without eating them? Around that time, a second female peregrine had arrived and was harrassing the resident female. On rare occasions an intruder will invade the nest and kill her rival’s young. Is that what happened here? No one knows because there was no webcam. But this year there is a webcam, installed by the Delmarva Ornithological Society, and it has already helped solve the mystery of the fight for this nest. At the end of Monday’s fight, we knew the resident male had won — for now. Is the fighting over? 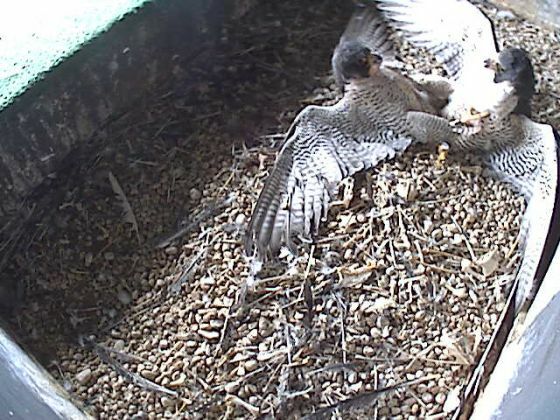 Will the resident male and the new female peregrine be able to raise a family in peace? We don’t know, but the webcam will help us find out. Click on the photo above to visit the Wilmington falconcam. In the meantime, see slides of Monday’s fight and read about it on Kim Steininger’s Wilmington Falcons blog. Her March 15th entry includes a link to a 21-minute video of the fight. And don’t miss the rest of Kim’s Wilmington Falcons website. You’ll really enjoy her photos! Kate–I’m confused. Did two males fight for the nest or two females? If the males, what happened to his mate? Maybe I just need to reread your blog after having some coffee. We know it is nature and the “order of things”, but these fights are so very difficult to endure. Especially when we become so attached to these gorgeous creatures. This year two males AND two females have fought for the nest. Last year, while there were chicks in the nest, a second female showed up. The two females had been sparring for months & now the resident female is dead. The male-against-male fight is new. I hope it’s over! This is what I fear will happen in regards to Tasha. Of course, it could happen at the COL as well. It could happen at anytime at either nest site. Hard to bear the thought on one level – but another it is the way of things. Powerful image. It’s so easy to forget that the Peregrines are a fierce, fighting bird and are wild. Wild and free. Thanks for sharing – its a reminder to stay detached and NOT to humanize the birds too much with sentiment or affection. geez, that was brutal. many things to ponder — does survival of the fittest insures survival of the species or do these battles diminish the species. on another note, Wilmington just refers to the birds as “our female”, “our male”, and intruder. No naming. As Traci commented it helps to stay detached and not humanize the birds. First, thanks Kate for including us on your wonderful blog, what a thrill! I was able to watch the fight from beginning to end (very difficult to watch, I must admit) and during the struggle, it appeared to me that our male was receiving the most punishment. I might add that this was non-stop action and it felt as though it might result in the death of one falcon. Towards the latter part of the fight, our resident was able to pull off a few maneuvers, and gain control. Thankfully, after an hour +, the intruding falcon flew away, followed a few minutes later by the victor. The USFWS Biologist associated with our project, Craig Koppie, later observed our falcon return to the box and fall over in exhaustion! Today, we have noticed the male and female displaying their bowing posture and much closer to each other than the previous observations. The resident male is banded — I believe with black/red which is a less common color combination nowadays. Peregrine watchers in Wilmington know the resident male is still in charge of the nest because the one they see on camera has black/red bands. I don’t know whether the male has been fully identified yet and, if so, whether he was named. As regards the new female, I bet they don’t know who she is yet. There will be a naming contest as soon as there’s more activity in the nestbox! We now know who the mystery female is! She was banded in Harrisburg, PA in 2008!